Come join us on February 18, 2017 at 5:30p.m. 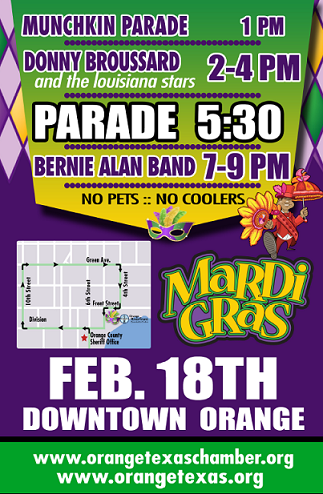 for the 14th Annual Mardi Gras Krewe of Krewe’s Grande Parade as we celebrate “It’s a Party”. A traditional Mardi Gras Parade with illuminated floats, decorated trailers and Krewe members tossing beads, cups and trinkets to enthusiastic spectators. The Greater Orange Area Chamber of Commerce invites you to stay in our hotels and enjoy Historical Downtown and the spirit of Mardi Gras. Beginning at 7:00p.m. there will be a concert by Bernie Allan Band at the Orange River Front and Pavilion. In addition the Munchkin Parade will be held at 1:00pm followed by musical entertainment by Donnie Broussard and Louisiana Stars. Food and beverage vendors will be at the event(No dogs, No pets, No coolers). Parade applications are available at www.orangetexaschamber.org or (409) 883-3536. All parade applications are due by February 8, 2017.